If you’ve already seen the title, congratulations – you know the point of this blog already! 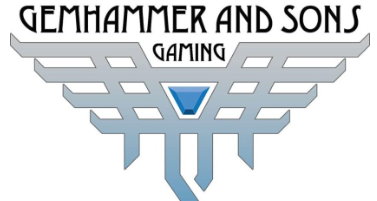 Our pals over at Gemhammer & Sons Gaming have just announced that they’ll have a glorious little booth at PAX East 2017! If you’re the type of guy, girl, or goblin that likes tabletop gaming accessories, you’re gonna want to check them out. As someone who has drank and rolled dice with these guys literally every Monday for the last two years of my life, I can safely say that they’re grade-A good people, and they’re bringing some of their signature #MoreBetter gaming goods to the show with them. Why, just check out the array of gorgeous stuff that’s sprawled out on my kitchen counter! The Gemhammer guys have previously got their vend on at other comic and game expos where they’ve run tabletop games and sold their flagship Decks of Various Amounts Of Things (see above). So if you’re going to PAX East 2017, make sure you keep an eye out for the Gemhammer boys on the show floor, and tell ’em Papa Dom sent ya. For more potential inter-company conflicts of interest, updates on what we’re doing at PAX, and the occasional drunk tweet – follow us on Twitter! And for all of those things in a sensual, hour-long audio format, subscribe to our podcast!